Getting a clear picture of how your brand is performing among your key stakeholder groups is crucial in making the kind of strategy and communication decisions that will drive future success. But developing a well-rounded understanding of your brand means finding hard to reach audiences, monitoring not just your brand but also competitors, and doing so across all audiences that impact your ability to thrive. 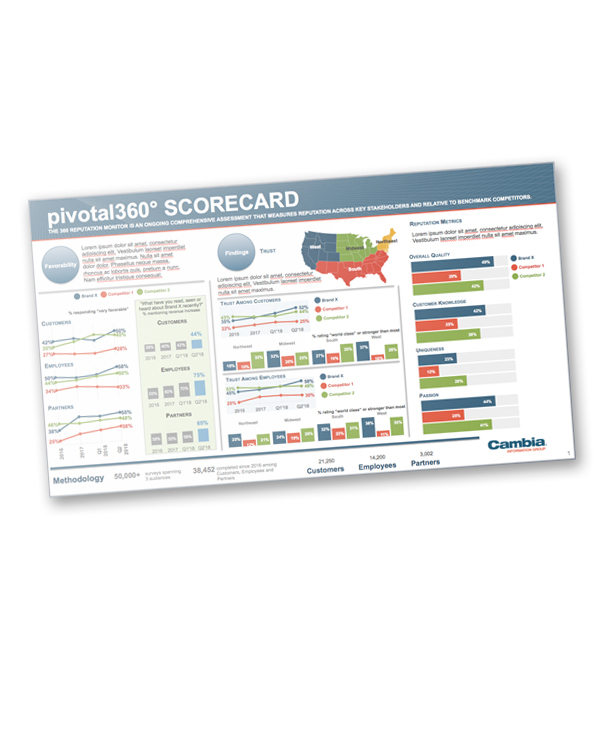 Cambia’s pivotal360® strategic measurement tool is designed to give you a complete picture of your brand’s strengths, weaknesses, and competitive opportunities across key stakeholder groups. Get the data you need to grow your brand with an affordable and comprehensive program. Then watch your stakeholder relationships, brand strength, and strategic initiatives thrive as you make data-driven decisions which maximize your organization’s competitive position.